First Impression: Whee! Look how long my hair is! Second Impression: Sometimes I play Mermaid in the pool! Whee! “Tara Stiles has got to be the coolest yoga instructor ever,” chirps a pull quote on the back of the DVD. When I think of someone who other people describe as “cool,” I think of someone who spent hours getting ready so they would look as if they don’t care. I think of a self-conscious person who strives for nonchalance. By that metric, Tara Stiles could be considered very cool. She does yoga in a series of floppy cardigans. No lame hoodies for her! Hoodies are so whatever. What, this old thing? I guess it’s a cardigan? It was my boyfriend’s. He got it from a designer he knows. They did the wardrobe for his band’s photo shoot. You probably haven’t heard of them. She also likes a whole lot of eyeliner. 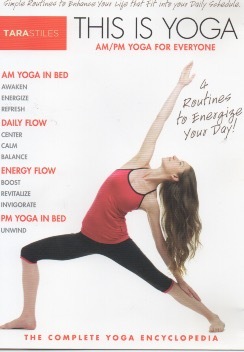 In the “Morning Yoga In Bed’ segment, it would seem that Tara keeps an eyeliner in her bedside table drawer to give herself a quick smoky eye before greeting the camera crew with a gentle side bend. Also, apparently Tara Stiles lives in a Danish hotel, with one blue wall, an impossibly fluffy, white duvet, and minimal furnishings. The other thing that makes Tara Stiles so, so, cool is that you can barely understand anything she says. Everything comes out in a rapid, monotone mumble. If consonants give words their meaning, and vowels give words their emotion, what do you get when you take away both? Your own sense of coolness, of course! What’s cooler than someone who doesn’t care if you know what they are saying? Yoga is supposed to help you relax, but hearing a constant, sotto voce Mumblecore patter is actually very stressful on the nervous system. It was like having a gnat constantly buzz around my head. I will add that this routine features the most irresponsible transition into pigeon pose I have ever witnessed. It’s like she wants you to injure your knee. So uncool. This entry was posted in Reviews and tagged 60 minutes, abs, didn't finish, talky, trendy, uncomfortable banter, yoga. Bookmark the permalink.